With a 39-31-12 record in 2014-2015, the Colorado Avalanche finished dead last in the tough Central Division. They had 90 points, more than Pacific Division clubs like the San Jose Sharks, Edmonton Oilers and Arizona Coyotes and more than Eastern Conference clubs like the Columbus Blue Jackets, Philadelphia Flyers and New Jersey Devils. Does this mean the Avalanche had a good year and were merely the victims of playing in a hard-hitting division? Not exactly. Colorado scored 209 goals, with only the Oilers and Coyotes scoring less in the Western Conference. And the Avalanche allowed a disappointing 223 goals against, going on to post a poor 16-16-9 record on the road. There’s a lot of young talent and top-tier skill on the roster, no question about it, but putting it all together has been a bit of a challenge. The Avalanche traded Ryan O’Reilly to the Buffalo Sabres, giving that team an immediate top-line centre. Colorado also acquired defenceman Francois Beauchemin via free agency, adding some veteran presence to the group. Colorado has a neat mix of youth and veteran skill up front and that can work out in their favour if they find the right combinations. Matt Duchene is the top line centre. The 24-year-old was drafted by the Avalanche in 2009 and remains a fast and productive player. He’s versatile enough and can shift to wing if the run of play calls for it. In 82 games, he put up 55 points including 21 goals. Swedish winger Gabriel Landeskog is a composed and skilled player with quality size in his corner. He scored 23 goals last season, finishing with 59 points in 82 regular season games. Expectations are still high for Landeskog and it seems Colorado is waiting for him to have a real breakout year, but a lot of that comes down to finding the right fit. He’s only 22 years of age, though, and there’s a lot of time to find that explosive touch. Nathan McKinnon is another thriller for the Avalanche. He’s a tremendously skilled player, scoring 38 points last season and skating like a dream. McKinnon will need some time to come into his own and he’ll get it with this hockey club, especially as he forges ahead of the Sidney Crosby comparisons and makes his own name for himself. Having veterans like Jarome Iginla and Alex Tanguay on the club will help give him that perspective. Defensively, this is an interesting group. Once again, the Avalanche boast a mix of young and older players. 27-year-old Erik Johnson leads the way with a terrific point shot and great skating skills for a player his size. He had 23 points in 47 games last season and plays big minutes. The knock on Johnson is that he can be found out of position too often, but a little more control and the presence of Beauchemin could help that problem resolve itself. Beauchemin brings experience to the club, plus his point shot rivals Johnson’s. That means a significant upgrade in power play fortunes for Colorado, especially if they figure out their cycle game. The trouble with Beauchemin can be found in the skating department, as he can often find himself behind in one-on-one situations. At 35-years-old, his game is pretty much set in stone. Defencemen like Nick Holden and Brad Stuart give this group depth, while prospect pickup Nikita Zadorov is a noble sign for the future. Zadorov came to the Avalanche in the O’Reilly trade and he’s an intriguing player with great reach. He’s 6’5 and weighs 220 pounds, too, plus he knows how to use his frame to box out opponents. He’s not a flashy player at all, but Zadorov embraces his shutdown role well. Tyson Barrie is a nice counterpoint, as he brings mobility and offensive flair. The Avalanche have placed all their bets on Semyon Varlamov, the 27-year-old Russian netminder. In 57 games last season, he picked up 28 wins and posted a 2.56 goals against average with a .921 save percentage. Varlamov is a big goalie and he boasts quick reflexes with a sturdy glove hand, but there are some positional concerns to be ironed out. Also, dude shouldn’t handle the puck. Reto Berra is slated as the backup right now, which is a good thing. The 28-year-old is a quality recovery goalie and he plays that classic butterfly style that makes use of his reflexes. Sometimes he drops too quickly, though, and that can put him in tough positions when he’s outdone by the shooter. 23-year-old Calvin Pickard is another option for Colorado. He has the work ethic to take over as a starter someday. Defence is the name of the game for Colorado’s prospect pool, plus there are some decent netminders in the system. Duncan Siemens and Chris Bigras are two of the blueliners worth looking at. Bigras has earned comparisons to Paul Martin for his swiftness with the puck and his tenacity in the shutdown role. The 20-year-old was selected by the Avalanche in 2013. Siemens, meanwhile, is another shutdown defenceman with big size. He could see action in 2015-2016. The aforementioned Pickard joins Spencer Martin in a fairly deep group in goal. Oakville’s Martin is a reliable netminder with a fighting spirit. He doesn’t give up on plays, but he has problems with positioning. The Avalanche picked Martin in the third round of the 2013 NHL Entry Draft and 2015-2016 could be a nice time to introduce him to some action. While there’s a lot of youth in the Colorado system, it’s hard to say that they’ll pay immediate dividends. 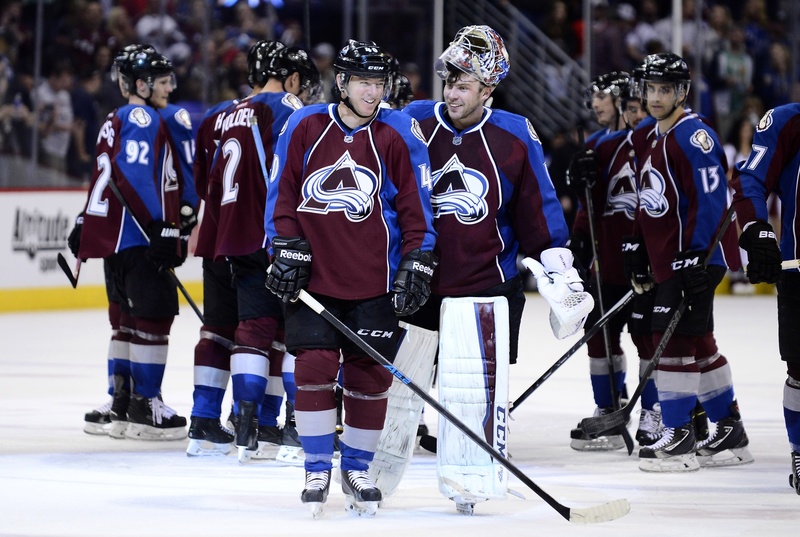 This could be another tough year for the Avalanche, especially as they work to cement themselves as a team and transition away from some of their older players. Having the likes of Iginla, Tanguay and Beauchemin should help the young blood overall, though. It’s doubtful the Avalanche will find themselves in the playoff picture, but they could make life more interesting in their division for the Dallas Stars and Winnipeg Jets. The hope is that they’ll score more goals while seeing solid netminding from Varlamov, which should help them round out and pick up some critical road wins. If not, it’ll be more of the same.